String instruments are unique in that they are built in different sizes to accomidate growing children. For that reason, all students who wish to rent a string instrument need to be fitted for that instrument by either the string teacher or by our staff at the store. For your convenience you are now able to pre-order a string instrument online. After pre-ordering you can just stop by the store with your child to be macthed to an appropriate size instrument and be on your way. 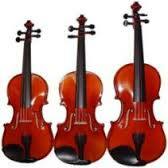 Student Size String Instruments are rented on a full school year basis.